From the moment he first appeared as Ziggy Stardust, David Bowie was the beautiful alien we fell in love with. In one swoop he made extraterrestrial life seem not only possible but desirable: wearing costumes and makeup with orange hair, commanding the spotlight in outrageous stage performances, embracing both sexes, creating a cult almost overnight… If he’d said he really did have a spaceship, his fans would have queued right around the world to beam up with him, to see if there really was life on Mars. When many another artist would have found his niche in the albums defined by The Man Who Sold the World, Ziggy Stardust and Aladdin Sane, Bowie refused to become a commodity, a predictable producer of the same old tried-and-true music that his record companies wanted him to be. He wasn’t interested in pleasing the suits. He wanted to be his own hero. His chart contains few yogas, but some of them are powerful, invoked time and again by the particular disposition of his planets and their dasa sequence. The most dominant of these is the Raja Yoga formed by Saturn and the Moon in Cancer in the 7th house. 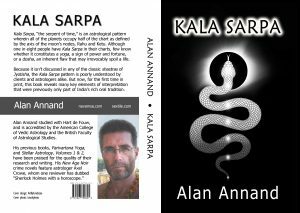 Saturn, retrograde with dig bala in the 7th, functions as a double-strength dharma (trinal/trikona) lord. Meanwhile the Moon, also double strength when full in its own sign, functions as a powerful karma (angular/kendra) lord. Whereas ascendant lord Saturn represents Bowie, the Moon among other things represents the masses, his public, his fans, indeed his relationship with the world. The two planets in the 7th also reflect upon his two marriages. Moon, lord of the 7th, represents his first wife Angela Barnett. Since the Moon is influenced by Saturn, this gave her character both a libidinous and business-like quality. She was a competitive free spirit, an ambitious actress and musician whose bisexual lifestyle inspired some aspects of the Ziggy Stardust glam rock persona. They married in Mercury dasa, Saturn bhukti, and divorced at the very outset of his Venus dasa. Second marriages are indicated by the 2nd house. By sheer coincidence this brings us back to the Moon/Saturn pair in the 7th house. Here, Iman is represented by 2nd lord Saturn, whose double strength implies her accomplishment and stature. Gratuitously, she just happens to be black, the color of Saturn. Whereas Angela was the Moon influenced by malefic Saturn, Iman is Saturn influenced by a benefic Moon. While Bowie’s first wife was predominantly a career influence, his second was more of an emotional touchstone. Indeed, it was love at first sight for Bowie, who said from the moment he met Iman that he was already wondering what to name their children. They were married in his Venus dasa, Saturn bhukti. Both marriages occurred in Saturn bhukti, which offers a classic example of Krishnamurti Paddhati (KP) at work. Primarily, marriage is promised in the period of any planet occupying the 7th, or in the nakshatra of a 7th-house occupant. Here, Saturn occupies the 7th in its own nakshatra, fitting the bill twice. Saturn is the pivotal planet in Bowie’s chart. For starters, it’s his lagnesh, or ascendant lord. It enjoys double strength through dig bala and retrogression. It aspects back into its own sign in the ascendant, fortifying his prospects for name and fame. And since it occupies one of its own nakshatras, Pushya, it works for itself during its own periods. In fact, many planets work on Saturn’s behalf. KP principle says that, when a planetary period runs, that planet will first and foremost deliver results for its nakshatra lord. If we inspect Bowie’s chart, note the ranges of 03deg20-16deg40 in water signs for the nakshatras owned by Saturn. Here we find four planets – Moon, Saturn, Venus and Ketu – in nakshatras of Saturn. Thus, when any of their periods (dasa or bhukti) run, they will strive to deliver results for Saturn. And because Saturn is Bowie’s 1st and 2nd lord, these periods (Moon, Saturn, Venus, Ketu) will promote his name and fame, his words and wealth, in addition to 7th house relationships as noted earlier. While we’re on this topic of nakshatra lordship, see also the cluster of planets in Bowie’s Sagittarius 12th house. Sun, Mars and Mercury all fall within the range of 13deg20-26deg40 of a fire sign, a Venus nakshatra. Thus, when any of these period lords (Sun, Mars, Mercury) operate, they deliver results on behalf of Venus. Bowie’s Venus is lord of the 5th (creativity) and the 10th (worldly status), and is found in the 11th (revenue from career) where it is amplified by a powerful node, since Ketu is considered exalted in Scorpio. To summarize, four planets in their periods will operate to serve Saturn (name, fame, wealth, relationships) while three other planets in their periods will operate to serve Venus (creativity, status, income). In other words, seven out of nine planets are driving his fame and wealth. Or to put it another way, Venus and Saturn are “karmic control” planets. It doesn’t hurt that Venus and Saturn are natural friends. 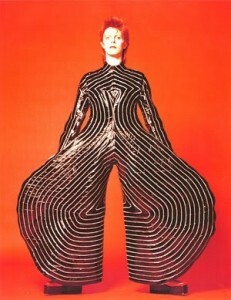 Venus rules the arts (Bowie was a connoisseur of many) while Saturn gives form and substance. Saturn sits right on the descendant, scoring maximum dig bala points, while Venus is only degrees from the midheaven. Bowie had a phenomenal impact on the music world, if not indeed western culture itself. He is generally acknowledged as perhaps the most innovative artist our generation has seen. His net worth was estimated at approximately $250 million. Understandably, he is one of the most instantly-recognized icons of our era. One facet of Bowie’s unique look was his left eye in which the pupil is permanently dilated (a condition called anisocoria). In 1962, during a fight over a girl, Bowie was punched in the face by a friend, at which time his eye was irrevocably damaged. In the physiognomic scheme of Vedic astrology, the 12th house governs the left eye. In Bowie’s chart, the Sun (itself a karaka for vision) and a combust Mars (combat) occupy the 12th. At the time of the injury, Sun bhukti was likely running. See Bowie’s hands in this same photo. The palms are relatively broad, his fingers distinctly long and elegant. Although this is scant evidence, I’m inclined to call this an Air-type hand, one whose owner is adept at concepts, communication, ideas and novelty. Note his ring fingers – extraordinarily long – almost as long as his middle fingers. The ring finger is ruled by the Sun, and when dominant invokes creativity, hedonism and risk-taking. 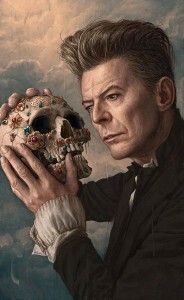 In the hands of an artist, it can indicate prodigious output and the ability to push the limits of creativity, taking risks with his oeuvre and his reputation, much as did Picasso, whom Bowie greatly admired. Bowie reportedly died of liver cancer. In Vedic astrology, both Mars and Jupiter rule the liver. In Bowie’s chart, Mars is in a terrible state – totally combust within a degree of the Sun in the 12th house. The liver is also indicated by the 5th house whose lord is Venus. Both the house and its lord are afflicted by the Rahu/Ketu axis – chaya graha – the shadow planets that are agents of cancer and other wasting diseases. Bowie also had heart problems, unknown to the public but dating back several years. Some reports said that he suffered six heart attacks in the past decade. The Aries 4th house is the place of the heart, and its lord is that afflicted Mars. In addition to combustion in a trikasthana, Mars also suffers the misfortune of being with two trik lords – 6th lord Mercury and 8th lord Sun. Even the Sun as karaka for the heart is afflicted. Mars and Mercury, however, do form two yogas. A Raja Yoga utilizes Mars as lord of the 4th (effort), Mercury as lord of the 9th (luck). A Dhana Yoga employs Mercury as lord of the 9th (luck) and Mars as lord of the 11th (money). Bowie also has a relatively uncommon Amala Yoga, formed by benefic Jupiter unafflicted in the 10th house, which invokes a certain admiration and respect in society. This same Jupiter also forms Kesari Yoga with the Moon in the 7th house. The angularity of both planets combine to grant him a natural talent for marketing and promotion. Note as well that this same Jupiter in the 10th is lord of both the 3rd and 12th houses. Connections between the 3rd and the 10th are one of the most common signatures for performing artists, whether actors or musicians. Although Bowie was never that happy with the roles offered him by the film world – “raging queens, drug addicts or aliens,” he said – he was nevertheless one of the most filmed musician/actors. As for drugs, 12th house afflictions are indicative of the self-destructive urges that lie unconscious at the root of many addictions. “I know how to borrow a cigarette in every language,” Bowie once quipped. But he was a heavy user of cocaine for many years and even experimented with heroin during his Ketu-Rahu period, a time when he admitted being pretty much off his rocker. Bowie’s 12th house configuration also played out in foreign exposure and spirituality. The 4th lord Mars in the 12th is a signature for the expatriate, and Bowie has lived and owned property in several countries – Switzerland, Germany, the USA, the Caribbean and Australia. For a time he was very interested in Buddhism, and actively studied under a notable rinpoche, who allegedly advised him he’d be better off to pursue music. His creative output was both prodigious and innovative. In addition to music and film, he produced approximately 5000 pieces of artwork, the vast majority of which has yet to be seen by the public. He is acknowledged as a master of the music video over the entire history of its genre. Indeed, one might even say that his whole life has been executed as a piece of living art, to which his swan song video Lazarus gives poignant testimony. Bowie’s 5th house is occupied by the iconoclastic and innovative Rahu, which encouraged experimentation, not only in his multiple stage personae, eg, Ziggy Stardust, Aladdin Sane, and the Thin White Duke, but in the many abrupt shifts in his musical direction. His 5th lord Venus is also on the Rahu/Ketu axis, where its association with a powerful Ketu in the 11th amplified his creative risk-taking nature, and ultimately rewarded him with a largely-loyal fan base and the financial rewards that went along with it. Borrowing a technique from William Burroughs, he experimented with cut-up techniques to create non-sequitur lyrics that were both puzzling and pleasing. He played around with other cut-up concepts, borrowing a melody or a chord progression from some earlier song, only to reverse it and sing/play it backwards to create something totally off the wall and unanticipated. He was an ouroboros, the serpent eating its own tail, constantly recreating itself in a cycle of destruction and renewal. Bowie was born into a Saturn dasa. From age eight to 25, he ran Mercury dasa. Its association with the Sun/Mars pair invoked fights (in grade school he developed a reputation as a defiant brawler), sexual experimentation, and spiritual inquiry. As noted above, Mercury in its periods will deliver results for its star-lord Venus, which invoked his musical and theatrical creativity. During this period he learned how to play several instruments and began writing music. He studied with mime artist Lindsay Kemp and began experimenting with stage performances. The Man Who Sold the World was released at the very end of this period. He ran Ketu dasa from age 25 to 32. During its period, a node typically acts as proxy for any planet with which it is associated or aspected, plus its sign or nakshatra dispositors. Here, Ketu gave results for its associate Venus, its sign-lord Mars and its star-lord Saturn. 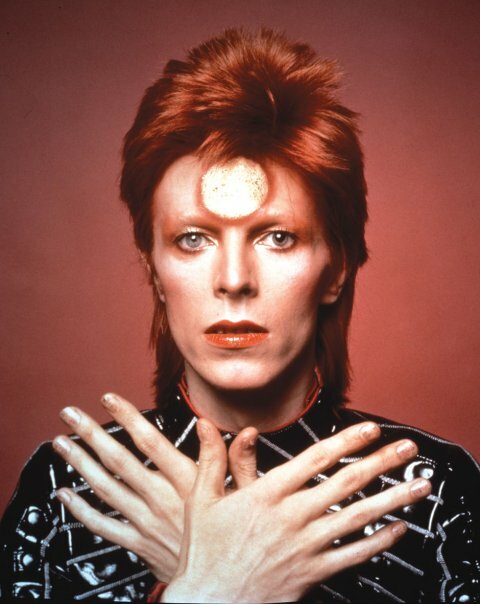 This period was highly innovative for Bowie, in which he produced his seminal album, Ziggy Stardust, followed by the equally iconic Aladdin Sane, both built upon their respective personae, a blurring of life-and-art that Bowie subsequently admitted was an omnipresent threat to his sanity. He formed lasting friendships with John Lennon and Iggy Pop, and collaborated with Brian Eno, Lou Reed and others. Just when he could have settled down into a groove, he released Diamond Dogs with its Orwellian stage production, then switched to the “white soul” music of Young Americans. 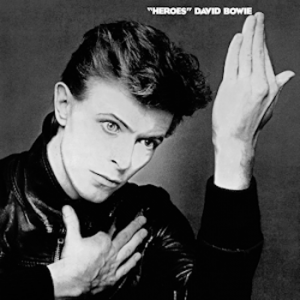 Then shifted gears again, introducing the new persona of The Thin White Duke to launch Station to Station, and then moved on to his “Berlin Trilogy” of Low, Heroes, and Lodger. In these seven years, he released nine studio albums across no less than three distinct musical styles! Venus dasa ran from age 32 to 52, during which time he met and married Iman, and released another nine studio albums. Although Venus is only a karaka (generic indicator) for relationships, as opposed to a prime significator, note that its placement on the nodal axis hints of foreign romantic partners. 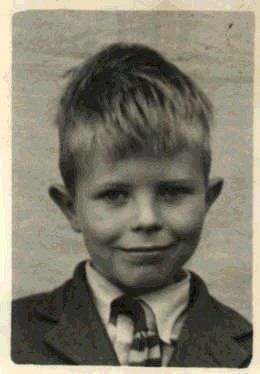 During Venus dasa Moon bhukti, Bowie’s older brother Terry, who’d been in and out of mental institutions for many years, killed himself. The elder sibling is seen from the 11th house. The 11th lord Mars is combust in the 12th house of loss. The presence of Ketu (surrender) in the 11th is destabilizing, and Venus there too functions as the 12th lord from that place of elder siblings. On the income front, Bowie became an innovator of yet another kind in 1997 with the introduction of the “Bowie Bond.” This was a whole new concept in financing, and the first of many “celebrity bonds.” Under this scheme, Bowie sold the future rights (a 10-year term) to all royalty income from albums produced before 1990. The entire issue of $55 million was bought by Prudential Insurance, and Bowie used the money to buy back the rights to songs owned by his previous manager. In 2007 the bonds were liquidated on schedule and the royalty rights reverted to Bowie. 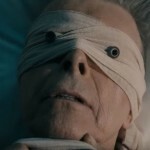 Also during Venus dasa, Bowie was at the leading edge of social media and internet commerce when he became the first artist to offer a download of his new song “Telling Lies” directly from his own website on ISP Bowienet. Both Bowie bonds and BowieNet were made available during Mercury bhukti. 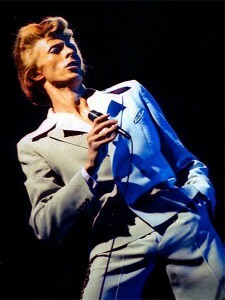 Bowie was also inducted into the Rock n’ Roll Hall of fame during Mercury bhukti. Although he’d previously refused an Order of the British Empire and other awards, he didn’t refuse this one. As noted earlier, Mercury delivers the goods for its star-lord Venus in the 11th. Bowie’s Sun dasa ran from 1999 to 2005. These were not good years for Bowie’s health, which began to suffer. In 2004, coming offstage from a show in Germany, he collapsed and was rushed to hospital for an emergency angioplasty. This was the first in a series of obvious heart ailments and attacks. The Sun is a general karaka for both the heart and vitality. In Bowie’s chart the Sun is the 8th lord of longevity, trauma and surgery. 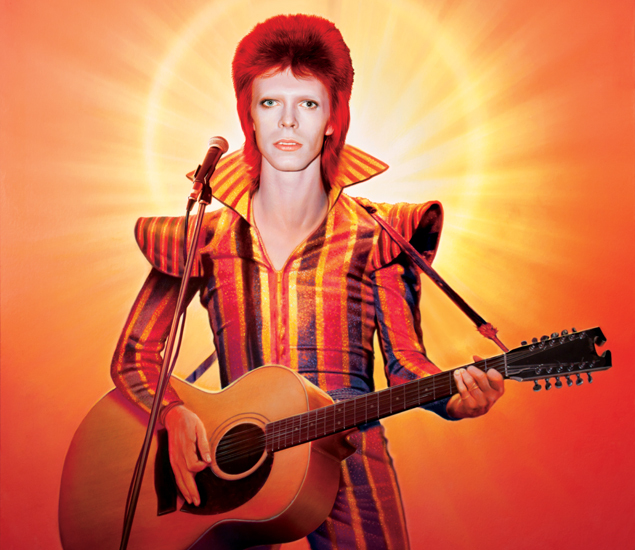 Sun and Mars afflict each other in the 12th, and they both afflict Mercury the lord of Bowie’s 6th. We can assume a pitta (Sun & Mars) aggravation lay at the root of it all. Bowie ran his Moon dasa from 2005 to 2015. In February 2006 (Moon bhukti) he received a Grammy Lifetime Achievement Award. This was the culmination of Bowie’s 39-year relationship with his public, the world. Otherwise, this was a reflective time for him, and he produced only one studio album in the decade. Quite likely, his thoughts were on the end of his life, as we’d expect for a Moon embraced by Saturn. His mind now faced the reality of its own extinction. “Time can change me, but I can’t change time.” Acknowledging that time could bring a young man growth and maturity, but he’d always be subject to its law. “Time takes a cigarette, puts it in your mouth.” Like a line from a gangster movie, where a thin white dude scores some smack in Berlin. “Time is waiting in the wings, he speaks of senseless things, his script is you and me, boy.” Life may sometimes seem like a surrealist movie, but in the end everybody dies. “I thought you died alone, a long long time ago.” Picture Major Tom adrift in space, staring out at the Milky Way, realizing he’s seen all this before in a previous life. 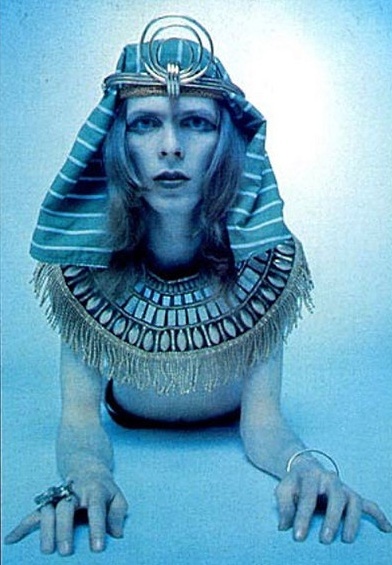 With Saturn a dominant planet in Bowie’s chart, its major transits marked his watershed years. His first Saturn return, in 1976, saw the release of Station to Station, the vehicle for his last great persona, The Thin White Duke, and a marked departure in musical style from anything that had preceded it. While Saturn transited his 7th house, Bowie took up residence in Berlin and began work on what would become his Berlin Trilogy of Low, Heroes, and Lodger. Saturn crossed Bowie’s ascendant in January 1992. Four months later, he married Iman. He experienced his second Saturn return in 2005, by which time his health was now under duress. Saturn, after all, is a full maraka (death-dealing) planet, being both lord of the 2nd house and occupant of the 7th. Bowie died 10th January 2016, two days after his 69th birthday. He was running Mars dasa, Rahu bhukti. Mars is karaka for liver, combust in the 12th. Rahu is a cancer agent, afflicting the 5th house liver. Mars as lord of the 4th also indicates the heart. Transiting Venus and Saturn, his two “karmic control” planets, were together in the 11th conjunct his natal Ketu. This strong Ketu is mokshakaraka, the doorway to liberation. From start to finish his life was as much a work of art as were his music, videos and other creations. David Bowie: from ashes to ashes, the prettiest star, a cracked actor, our rebel rebel… In both his life and art he became something more than human – an avatar of Shiva – a god of creation, destruction and renewal. In Station to Station he sang, “I think I must be one in a million.” He got that wrong. He was a singularity – one in seven billion. 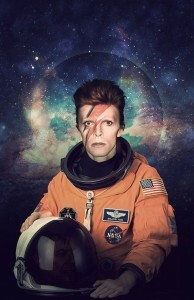 We salute you, Major Tom. Bon voyage. And may God’s love be with you.